There’s a bandwagon going around full of delicious things like chocolate, graham crackers and marshmallow crème. I was so taken in by it all, I just had to jump on too. Who could blame me? 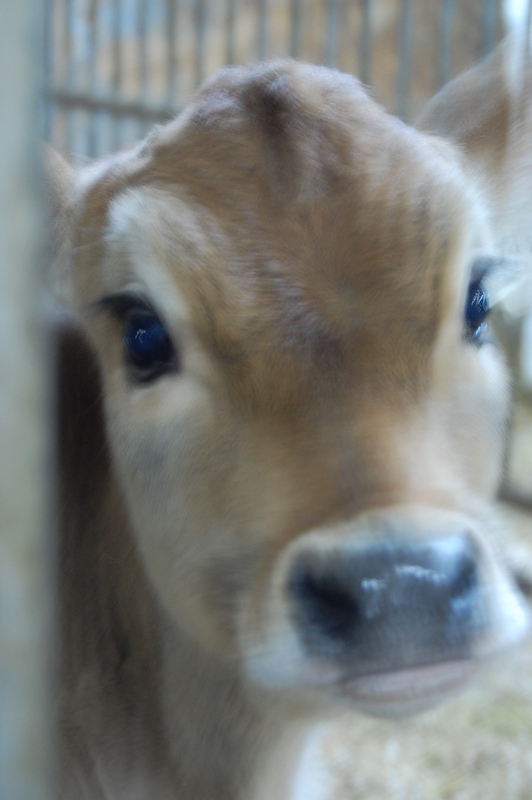 Things like this are hard to resist. And who’d want to anyway? You can never have enough deliciousness like this in your life. I’m a total pushover when it comes to these delightful mini chocolate bundt cakes, topped with graham crumbs, oozing marshmallow crème and sprinkled with shaved chocolate. And eggs. The eggs represent Easter. New life. Hope. The little chocolate cakes are mini bundt’s. I have a new pan that I’ve been wanting to try out so I made this using a chocolate cake recipe that is deliciously light because I decided to use yogurt when I discovered I didn’t have sour cream. Although it’s light, the cake tastes amazingly fudgy when you bite into it which really lends itself to the whole s’mores thing. I sprinkled them with graham crumbs mixed with melted butter before baking so that they would stick to the chocolate batter when baked. When the mini bundt’s were cool, slightly warm, I topped them with homemade marshmallow crème. As you can see, because the little bundt’s weren’t completely cool yet, the creme melted slightly and drizzled down the sides which I thought actually ended up looking kind of cute. 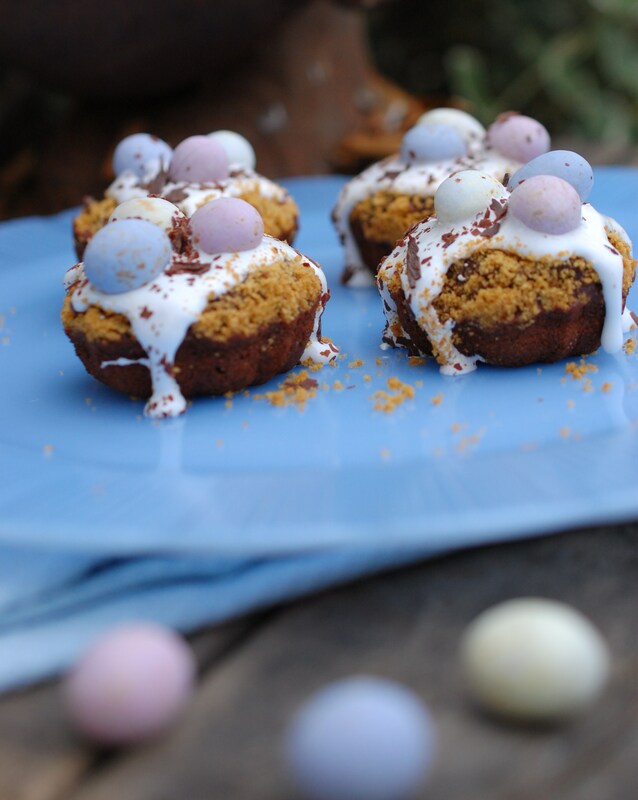 I sprinkled the marshmallow creme with some shaved chocolate and topped them with speckled Easter eggs. 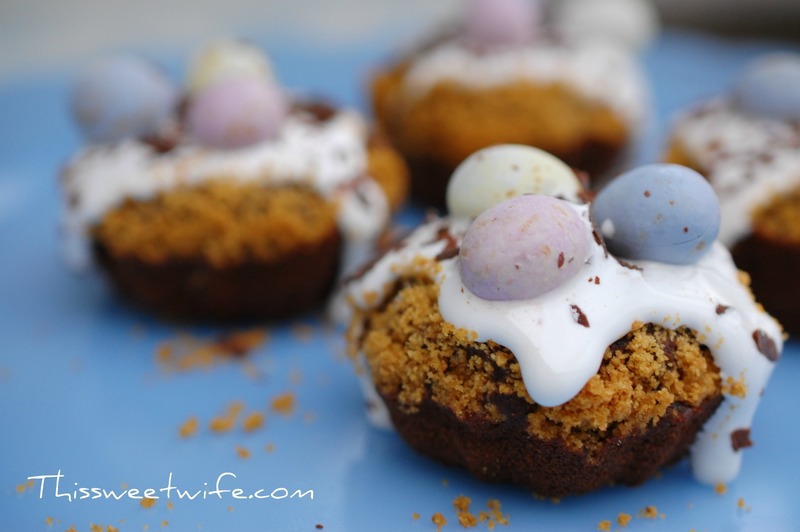 These s’mores would make a great treat for family and friends this Easter and they’re not at all difficult to make. For the very first time, I made my own marshmallow crème and could not believe how easy it was. It had never occurred to me before that you could make marshmallow creme at home using really simple ingredients until Brenda, from a Farm Girl’s Dabbles mentioned it. Brenda makes gorgeous homemade marshmallows. You can see more of her amazing creations by visiting her blog here. 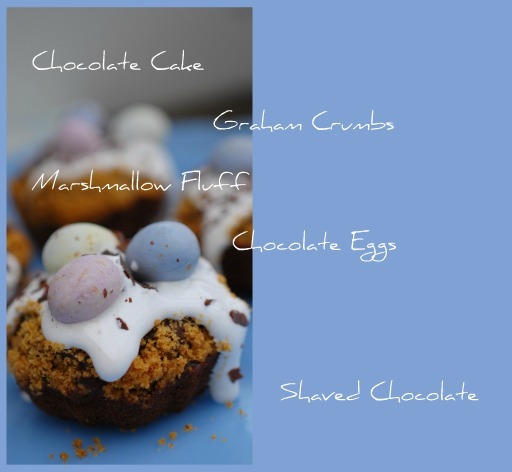 the mini bundt cakes, the graham crumb mixture, the marshmallow crème, the shaved chocolate and the mini chocolate eggs. Crush the crackers by placing them in a sealed plastic bag and rolling over them with a rolling pin or placing them in a food processor until finely crushed. 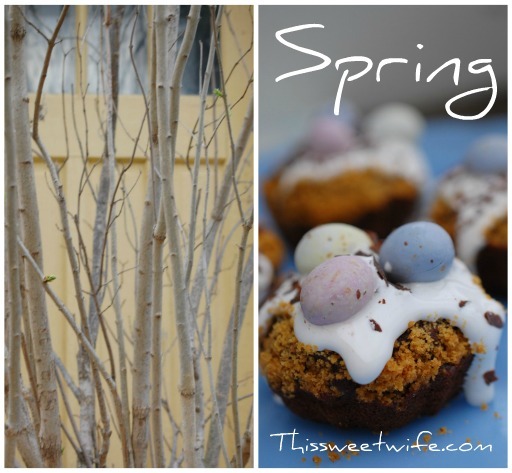 Set aside while you make the chocolate mini bundt/cupcake batter. Preheat oven to 350° and grease mini bundt pan or as another option you can line your favorite muffin pan with cupcake liners. Sift flour, cocoa powder, baking soda, baking powder and set aside. In the bowl of an electric mixer fitted with the paddle attachment, cream butter and sugar until light. Add eggs, one at a time, mixing after each addition until light and fluffy. Pour 1/3 cup of the flour mixture into the large bowl and mix until combined. Add 1/2 of the yogurt and mix until combined. Add another third of the flour mixture and mix until combined. Add the remaining yogurt and flour mixtures, mixing after each addition, until combined. Add milk and mix until combined. Scoop into prepared pan until 2/3 full and cover with prepared graham crumbs (see above) using 1 tablespoon per mini bunt or cupcake. Bake for 15-17 minutes, or until toothpick or skewer comes out without crumbs attached. Try not to over bake these so they come out tender. They are far better slightly under baked, than over baked. Cool on wire racks in pan for 5 minutes, then gently turn onto rack and cool completely. In the bowl of an electric mixer fitted with the whisk attachment, combine egg whites, corn syrup and salt. Mix on high-speed for 10 minutes or until thick. Add in icing sugar. Before turning on your mixer, you may want to incorporate the icing sugar with a spatula so that it doesn’t all come flying out of the bowl or attach the plastic shield to your mixer, if you have one. Beat on low-speed until well blended. Add vanilla and mix until blended. }}This marshmallow crème whips up to a glossy white, is satiny smooth and fluffy.
}} It can be used immediately or stored in an airtight container in the refrigerator. 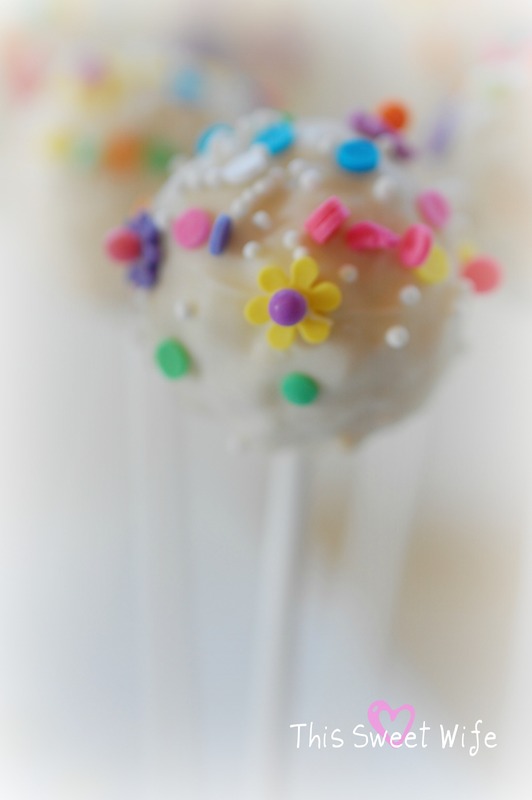 }}You can flavour the crème by substituting a flavoured extract for the vanilla. 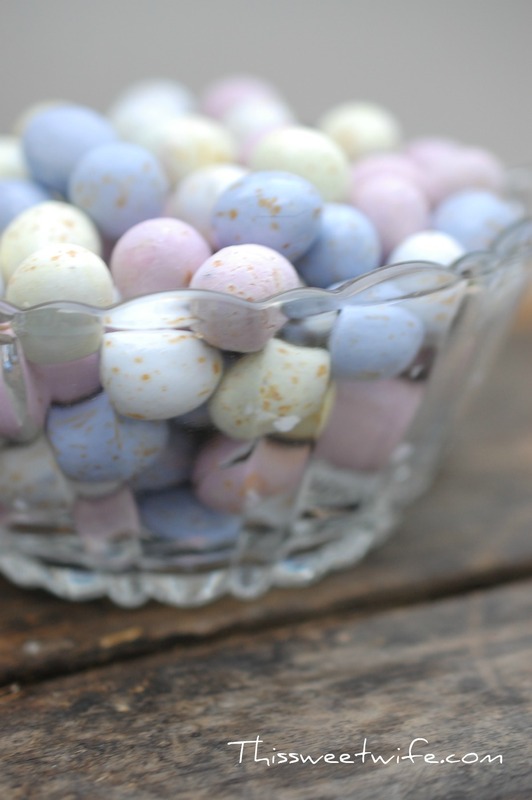 }}You can colour the crème by adding a drop or two of food colour. Start with a mini bundt or cupcake, top with a dollop of marshmallow crème, followed by a sprinkle of shaved chocolate and top it off with some of your favourite eggs or chocolate. Today is a beautiful, apple-icious day! I love Spring. It just may be my favorite season. It and Summer. The Fall is pretty nice too. It’s winter I’m not so fond of. The snow is pretty, it’s the cold I have issues with, though I know some people like it. This week has been filled with mild temperatures and bright sunny days. It’s almost like a pre-cursor of what’s to come. My husband reported seeing his first Robin already and the Killdeer are quickly taking up residence here. The thing I love most about Spring is feeling the warmth of the sun on my face and I ‘m so looking forward to the heady scent of apple blossoms wafting from the trees. That and flowers popping up everywhere, getting re-acquainted with my Spring bulbs, fresh green grass and buds on the trees. I have to admit it’s been a mild winter here in Ontario, even by my standards, and it seems almost too good to be true, that Spring is officially just a week away. So this may seem rather odd, especially since we’ve just sprung our clocks forward an hour in anticipation of Spring, but I’m going to ask you to indulge me for just a moment. It wasn’t all that long ago, really. Think falling leaves, warm winds and crisp green apples. Or curly haired sheep with beautiful blue eyes and straw on their forheads. Or pink pig caramel apples with candy watermelon slice ears, m&m eyes and a marshmallow snout. Fall for me always includes a county fair or two and a delicious caramel apple. Or two. I know some of you worry about all that messiness. Not me. No Siree. I’m all for messy, when messy tastes that good. I love the crispness of the apple and the chewiness of the thick caramel followed by the deliciousness of the chocolate and crunchy peanut coating. Mmmm, so good. I made this yummy treat last week and it reminds me of all of that minus the chocolate but with peanut butter, apples, Skor bits, caramel and chopped peanuts all on a sugar cookie crust, and sprinkled lightly with cinnamon, you won’t miss it. 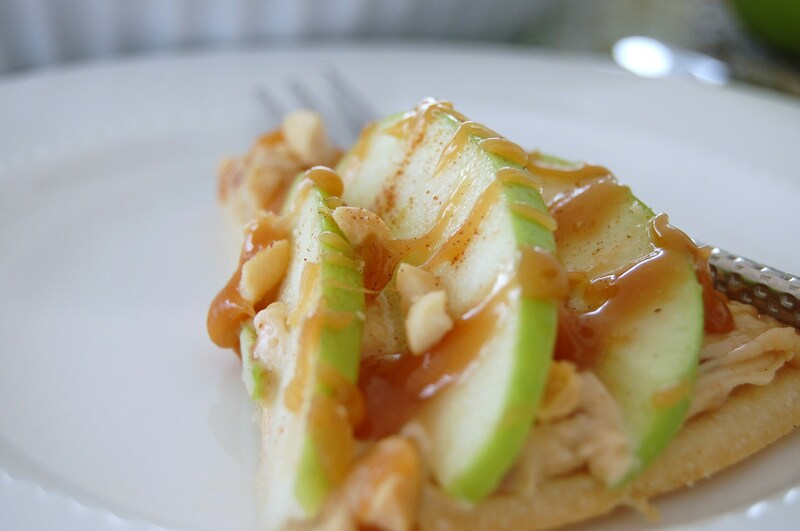 This Apple Caramel Cookie Pizza is a delicious treat and will be sure to delight young and old alike. 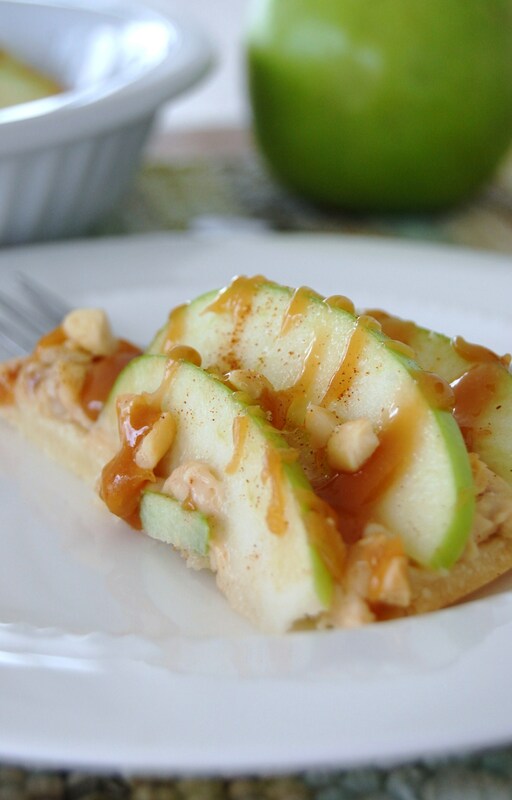 It combines the flavours of “Fall Fair” caramel apples on a delightful sugar cookie crust that is so yummy and delicious, it will literally disappear before your very eyes. Seriously. You’ll be, like, wait a minute — where’s the Apple Caramel Cookie Pizza I just made? No seriously, is this a joke? So my advice is, cut yourself a generous piece before serving, because as soon as you turn around, it will instantly disappear ~ it’s that good. Now you can go back to blue skies and the sweet smell of Spring. Oh, that does sound good, doesn’t it!! Happy, happy, happy! 1. Pat cookie dough into a pie pan or lay it on a pizza pan coated with cooking spray. Bake at 350 °F for 12 -14 minutes or until slightly brown around the edges. Cool completely. 2. In a small bowl, beat the cream cheese, brown sugar, peanut butter, and vanilla. Add Skor pieces and stir. Spread over sugar cookie crust. Arrange apple slices on top in a circle. 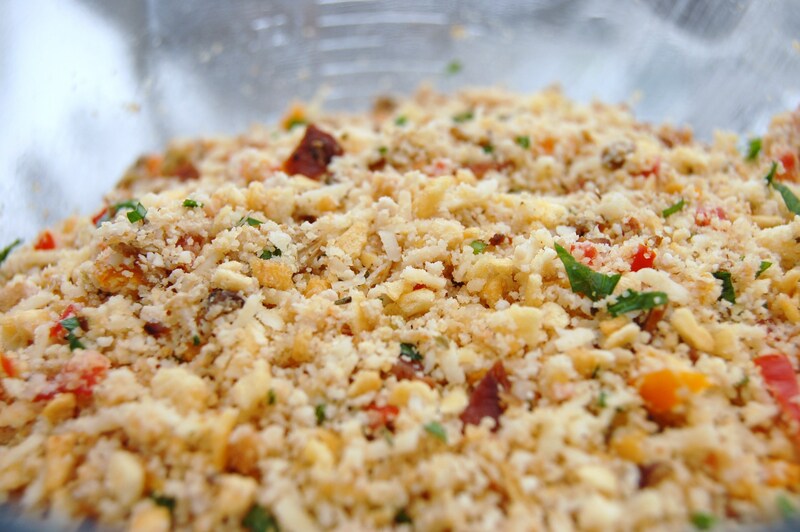 Sprinkle with chopped peanuts and dust with cinnamon. Drizzle with warmed caramel topping and cut into wedges to serve. To prevent the apple slices from browning, I brushed them with a pastry brush dipped in a solution of 1 tablespoon lemon juice and 1 tablespoon water. 1. Place the water and sugar into a small, heavy saucepan over medium high heat. Cook undisturbed until the sugar starts to color around the edges. Gently swirl the pot to even out the color and continue to cook only until the mixture turns a light amber. Immediately remove the pan from the heat. 2. At arm’s length, gradually stir in the heavy cream. Be careful as it will bubble up. Stir until the caramel is smooth. When the bubbles subside, stir in the vanilla extract. Like all caramel, this sauce thickens considerably as it cools. 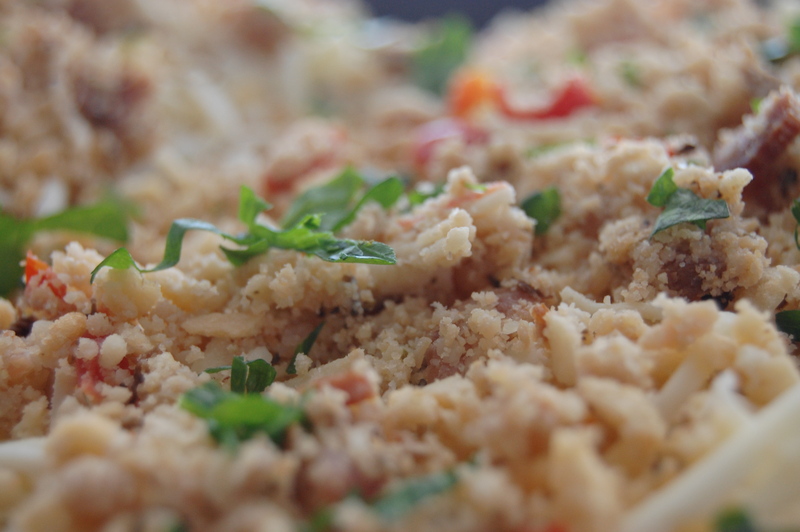 It can be made ahead and refrigerated, then reheated for a few seconds in the microwave or on the stove over low heat. The sauce will be quite stiff when cold and will thin as it warms. Caramel sauce can be kept covered and refrigerated until the best-by date stamped on the cream carton.